About: The original woodblock print produced roughly 5000 copies, a few of which have survived into art museums around the world. Location(s): Metropolitan Museum of Art, Los Angeles County Museum of Art, National Gallery of Victoria plus more. Ukiyo-re is a genre of art popular in Japan in the 17th, 18th and 19th century. People, folk elements, landscape and everyday life are the common themes. The Great Wave is a woodblock print by the ukiyo-e artist Hokusai. The master artwork depicts a large wave walloping boats off the coast of Kanagawa Prefecture. In the background is Mount Fuji--an enduring symbol of the island nation. This is the first print in Hokusai's Thirty-Six Views of Mount Fuji and is arguably the most recognized one. The Great Wave is Japan's most famous artwork and is not by accident. 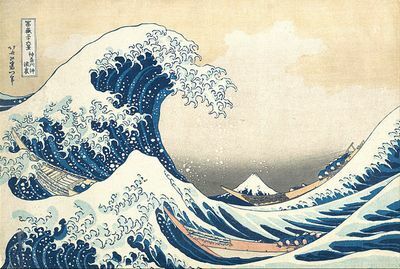 The large rouge wave in the print, which is sometime mistaken for a tsunami from an earthquake or a wave associated with a strong wind storm, exhibits sophistication not found in similar works. The height and scale of the wave demonstrate the terror of the sea--a great significance to the Japanese whose traditional livelihood depends on fishing and sea life. Note how Mount Fuji appears trivial in the background. This could be due to draw distance, but it could also have been done to enhance of intensity of the wave. The way the wave’s crest is depicted adds realism and urgency to the scene. Note how the colors of the waves and their crests match those of snowcapped Mount Fuji. This indicates the scene is in winter. It also shows a strong connection between Japan, represented by Mount Fuji, and the sea which is important to its viability.